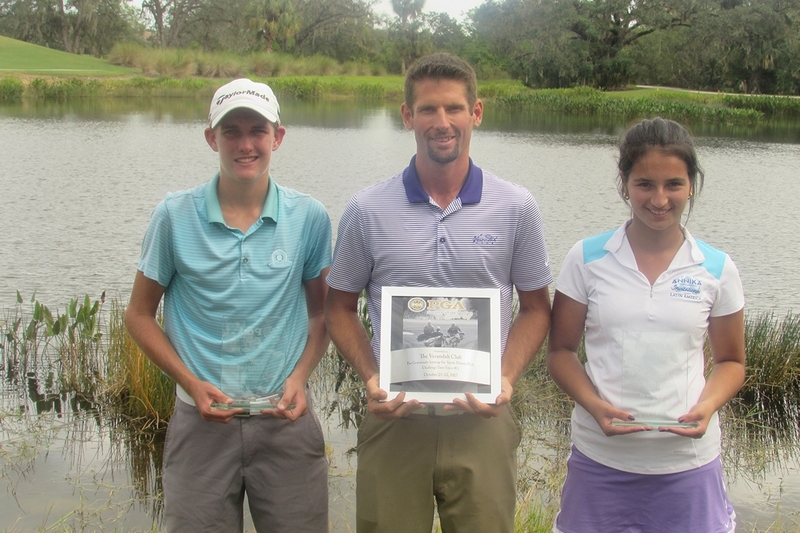 ATLANTIS, Fla. – This week, the South Florida PGA Junior Challenge Tour presented by The Honda Classic held Challenge Tour Event #11 on the Old Orange Course at Verandah Golf Club in Fort Myers, FL. Palm City native Garret Giles continued his strong season this weekend. Giles, who has two wins and two top-five finishes on the season, opened up round one with an even-par 72 to take a three stroke lead in the boy’s 13-18 age division. Parkland native Gabriel Hegerstrom and Stuart native Royce Howley each fired rounds of 75 to keep within distance of Giles. Giles saw his lead start to slip away on the front nine after a 3-over-par 39 but was able to battle back with a birdie on hole 12 to capture the overall boy’s title by two strokes. Hegerstrom would take home the boy’s 13-15 age division, while Miami native Justin Rabin would take home the boy’s 16-18 age division. Laura Edmonds moved to Weston, FL less than a month ago. Eager to establish herself in South Florida, Edmonds joined the South Florida PGA to see how her game would stack up in the area. Edmonds fired an even par 72 during round one to take a four stroke lead over Boca Raton native Chloe Kovelesky. Edmonds followed up her strong opening round with a final round 3-under-par 69 to capture the overall girl’s title. Edmonds proved this weekend she can be a force in the girl’s division for a long time. Kovelesky would go on to capture the girl’s 13-15 age division, while Estero native Kelli Kragh took home the girl’s 16-18 age division. North Palm Beach native NaShawn Tyson won his fifth title in the boy’s 11-12 age division after rounds of 73-72. Port St. Lucie native Gloria Nip captured her 2nd title in the girl’s 11-12 age division after rounds of 76-77.